Metalguard provides metal building roof leak repairs. We can stop your leaks without a roof coating, call us and we will explain how. Is your metal roof in good shape except for a leak, or two or three? Is a small area leaking? We have a leak repair service you might be interested in for your metal roof. We offer our metal roof leak repair contractor service when your roof does not require a roof replacement or a complete sealing and coating. Common leaking areas include roof vents, penetrations, at the eave, fasteners, internal gutters or valley gutters, skylights and seams. Metal roof leak repair at the eave and internal gutter. This area was rusted out so we replaced the internal gutter and the eave. 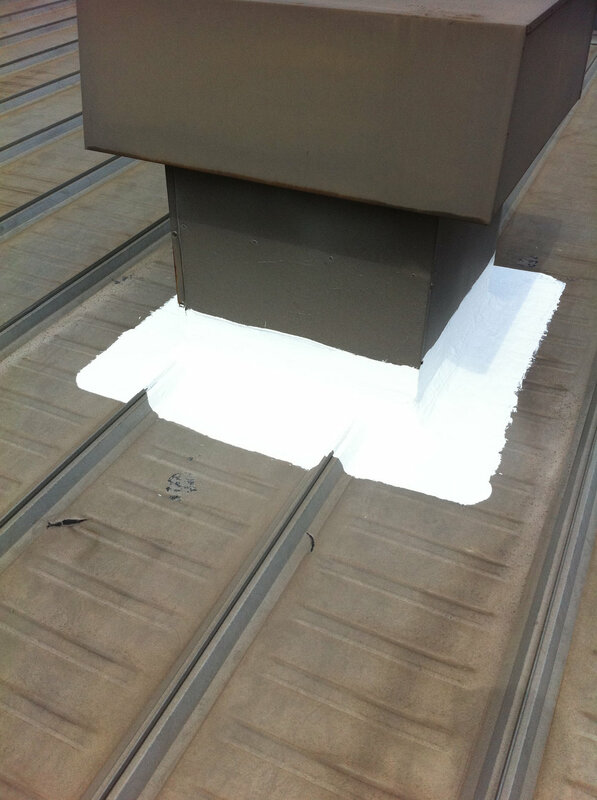 Metal roof leak repair at a vent, sometimes the metal roof leak repair is very simple, like sealing with a urethane metal building sealer around a vent, as you can see below. Below, the problem was the initial installation of the transition trim. Over the years other contractors tried “gooping” up the panels with whatever they could find. It caused more problems than it solved. Below - Metal roof leak repair by replacing the transition trim and two runs of the roof panels. Not need to replace all of the panels. Check out the rest of the site for additional repairs to metal buildings. Steel manufacturing companies want you to replace your roof, coating manufacturing companies want to coat your entire roof. We just want to fix your problems. Our metal roof leak repair service team provides services at a reasonable cost and we provide the initial quote at no cost. If your metal roof is also connected to an epdm rubber roof, or build-up roof, we can help with that also. Houston, TX. Give us a call and we can schedule a leak repair service call. We have been stopping roof leaks for over 20 years!